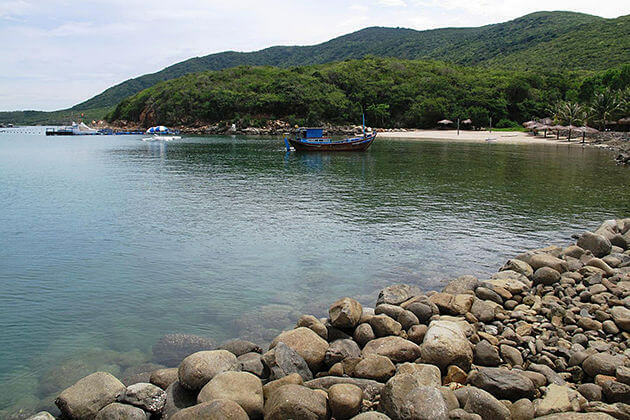 Set foot on an S-shaped country – Vietnam in 12 days to explore the beauty of its nature, culture and people. 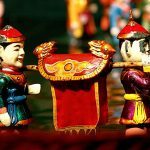 Our itinerary includes many highlights of this country from the South to the North like Ho Chi Minh City, Mekong Delta, Hoi An, Hanoi, Sapa and Halong Bay where you can get diverse experiences from the eventful life of big cities, breathtaking mountainous area to the tranquil landscape of one of the most well-known heritages of the world. Warmly greeted by our tour guide and driver when arriving in Ho Chi Minh City, we then transfer to hotel and check in. Spend the rest of the day relaxing and enjoying welcome dinner at a cozy local restaurant. Overnight in Ho Chi Minh City. 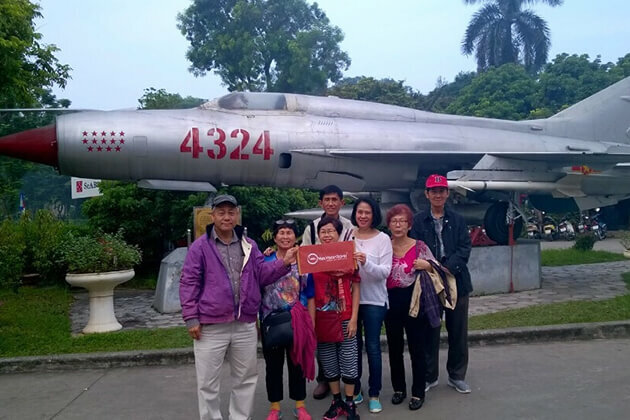 Morning sightseeing with local tour guide introduces us to some famous attractions of Ho Chi Minh City including Reunification Palace, War Remnants Museum, Notre Dame Cathedral and Post Office. At lunchtime, enjoy tasty one of the most outstanding Vietnamese traditional dishes – Pho (rice noodle soup) at Pho 2000 Restaurant. Afterward, continue our city tour with Giac Lam Pagoda to get insights into a different religion – Buddhism, “Chợ Lớn” (Big Market) and Ben Thanh Market. Overnight in Ho Chi Minh City. 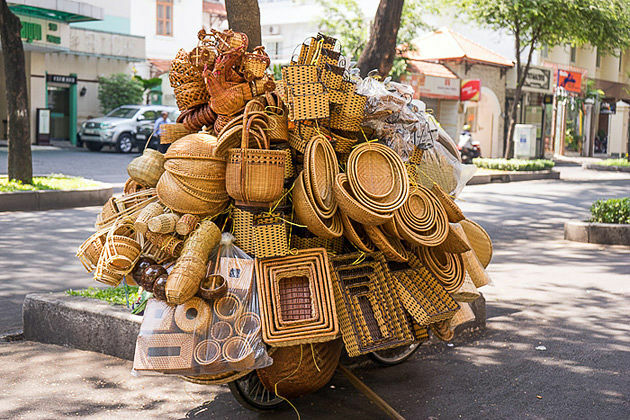 Leave Ho Chi Minh City this morning, we drive to Mekong Delta to visit Cai Be – one of the most hustling and bustling floating markets of this region where we can find a variety of products put in a hundred boats on the river. It is a pleasure to the eye when to see products are hung on a stick by sellers to show what kind of goods they want to sell to buyers. 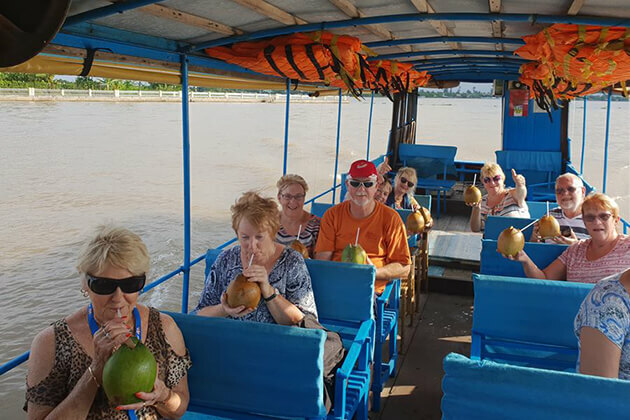 Take a boat and start our tour with local workshops or handicraft villages producing rice paste, coconut candy, pop-rice, pop-corn, rice net, fish sauce, soya sauce, and salt, etc. After lunch and take a short rest, our boatman will take us to farther villages to visit traditional houses made of wood and palm tree leaves or watch farmers catching fishes and pick fruits, etc. 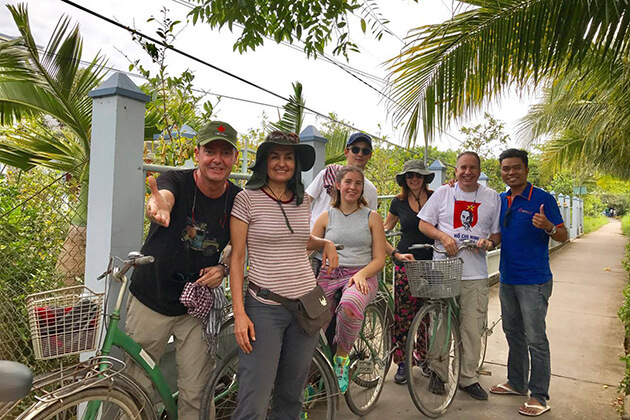 Get more insights into daily life of local people and enjoy the beauty of the countryside by taking a bike tour to ride around the village. In the late afternoon, back to home-stay to make our dinner with a friendly host. Enjoy our meal then drink tea and rice wine while having a colloquial talk with them. Overnight at home-stay. After breakfast, stroll around the village to enjoy the fresh air before say goodbye to the host and embar onk a boat to continue our trip. Row the boat to pottery village to see local people creating fine products from clay. End the boat trip, we visit Vinh Long Market in town then return to Ho Chi Minh City to take a flight to Danang. Transfer to Hoi An after arriving in Danang. Check in a hotel and spend the rest of the day relaxing. Overnight in Hoi An. 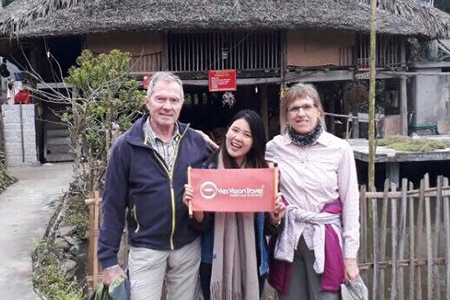 A half of the day for walking tour around the town to visit famous sites of Hoi An including Japanese Covered Bridge, Pottery Museum, Tan Ky Old House, Cantonese Congregation, Silk Street and several temples and pagodas built in Chinese style. Leisure time for us in the afternoon. This morning, transfer to Danang International Airport from Hoi An for a flight to Hanoi. Welcomed by our tour guide, we then move to a hotel in the city center and check in. 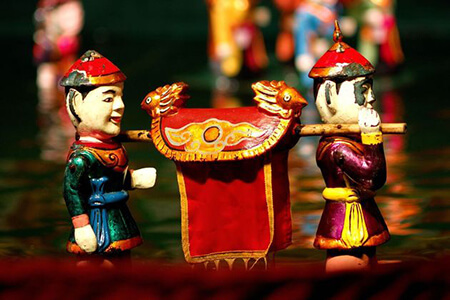 In the evening, we have 1 hour enjoying Water Puppet Show – a kind of Vietnamese traditional performance. Back to hotel and have a rest. Morning itinerary includes well-known attractions of Hanoi. Firstly, visit Ho Chi Minh Complex consisting of Ho Chi Minh Mausoleum, the Stilt House, Presidental Palace, Ho Chi Minh Museum and One Pillar Pagoda. Next, we set foot to Temple of Literature to get insights into the first university of Vietnam where recognize many talented people from Ly Dynasty (1009 – 1225). Nowadays, Temple of Literature is a symbol of education and an attractive sites for both Vietnamese people and foreigners to visit. 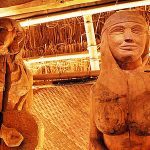 In the afternoon, continue our city tour withthe Museum of Ethnology where exhibits many value documents and images of 54 ethnic minorities of Vietnam. In the evening, transfer to Sapa by train. After arrive in Lao Cai railway station, we quickly move to Sapa Town to check in and have breakfast. Take a rest before trekking to Cat Cat Village, Ho and Y Linh Ta Van Village which are habitations of Black H’mong. 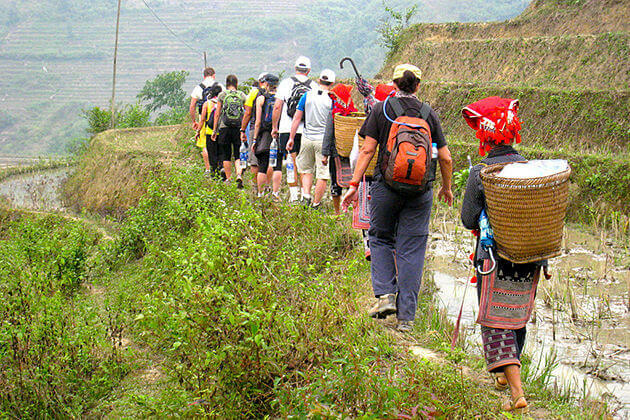 Next, trekking on a trail through rice paddy terraces and enjoy beautiful mountainous landscapes. Have lunch in a local restaurant nearby the river. 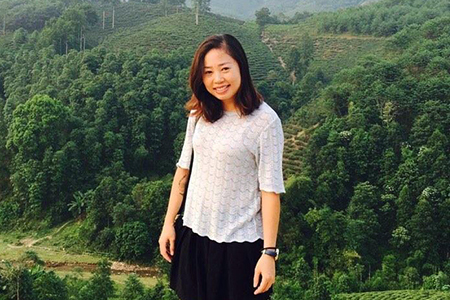 Overnight in a home-stay of Giay people in Muong Hoa Valley. A full day of trekking along Giang Ta Chai and Su Pan – villages of Red Dao people to get more insights into a life of ethnic minorities. Tonight, back to Sapa and prepare for a night train to Hanoi. Welcomed by our tour guide and driver in Hanoi, we transfer to a small hotel for a short rest before visiting Halong Bay for 2-day cruise trip. Cruise along Red River to Tuan Chau Port, then boatman takes us around Halong Bay. Enjoy delicious seafood (vegetarian menu is available) while marveling various unique shapes of islands like old fisherman (La Vong Islet), an eagle looking for food (Dai Bang Islet) or a pair of chicken standing together (Trong Mai Islet) etc. Then, we discover the beauty of diverse system of grottos and caves in Halong Bay such as Thien Cung Grotto (Heaven Palace) or Sung Sot Grotto (Amazing Grotto) and swim at Titov Beach. End of the day, enjoy sunset glow from the cruise and have a cup of tea or coffee ordered from bar. Dinner and overnight on the boat. Wake up early in the morning and have breakfast on the cruise, warm up our body with Tai Chi exercises then kayak around the bay to enjoy the breathtaking scenery of one of the World Heritages. Back to the cruise, watching a cooking demonstration from our chef to learn how to make a simple Vietnamese dish – spring rolls. Enjoy our lunch before disembark and back to Hanoi. Our holiday ends with breakfast this morning then our driver will take us to the airport for departure flight. Meals as specified in the itinerary with authentic local food. Western food is available (up on request) (B = Breakfast, L = Lunch, D = Dinner).